Rinascimento was developed by perfumer Alex Lee, and is described as a unisex fragrance inspired by the ancient symbol of Florence, the lily. TOP NOTES is a mix of Italian Mandarine, Basil and Green Pepper, for a powerful and sparkling impact. The flowery HEART feels like a daring bouquet where the green notes of the Lily combine with the Tuberose magnetism and the delicate voluptuousness of the Iris Butter. Sandalwood and Orcanox add a sensual touch to the BASE, while the Vetiver makes it vibrant. 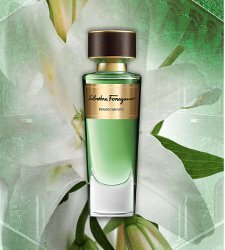 Salvatore Ferragamo Rinascimento is €220 for 100 ml Eau de Parfum. Eleven – oh good grief, whatever happened to exclusivity & less is more?! Well, they did release them over a period of years. Overall, it still can’t touch Tom Ford Private Blend, or Bottega Veneta, etc. But I agree it’s a lot of perfume! Hey at least they unified them under one line! About the name changes: “testa do Moro” was probably considered offensive. Even if there was a historical reason for the name. “Moorish face” … Imagine a perfume called “Asian Face” …. But Testa di Moro is the NEW name! When you Google it, you see many items for sale in this color. Nonetheless, it looks like it harks back to Venice, Saracen pirates, and those now controversial blackamoor brooches, so not an astute choice for an international brand.